Some flaws in design, but playing heroes with a limited lifespan provides interesting decisions and choices. Characters rarely age in games, with exceptions like Crusader Kings 2 or The Sims, or perhaps the intro to Fallout 3. 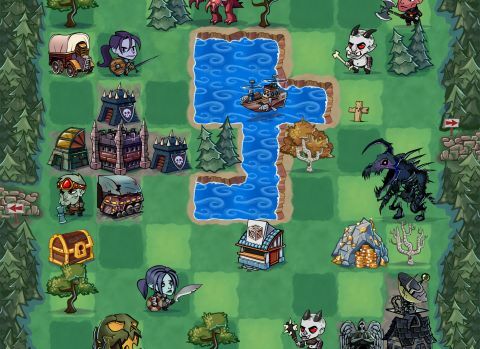 In Hero Generations, a turn-based RPG from Heart Shaped Games, aging is front and center because each turn of the game and each move across the procedurally generated map deducts a year from your lifespan. The result is that you and your tiny adventurer face tough decisions at nearly every step. On maps shrouded by fog and dotted with forests, shrines, volcanoes, and wandering monsters, one eye is always on the clock. How much life do I have left? Can I complete a quest, battle a few monsters, or uncover more hidden areas before it's too late? This careful game of time management, risk assessment, and weighing of priorities is both challenging and fun, and at times even a bit sad, such as when you realize your rapidly aging hero simply doesn't have enough time left on the clock for one more battle or quest. Unlike most RPGs, where you'll eventually check off every item on your to-do list at some point, here you have to constantly compromise, picking one task at the expense of another, and I find that different and refreshing. When your character dies in Hero Generations, it's permanent, but death doesn't necessarily bring an end to your game or your dynasty. You can find mates in towns, tromp off to bed, and produce an heir to continue your adventure on the same set of maps. Items you've collected, like weapons and tools, can be passed down to your children, as well as some attributes from either you or your mate. You can also improve the odds of your offspring's positive traits by fortifying towns with barracks, farms, and other buildings. Acquiring fame by defeating enemies and completing quests can also help you find more desirable mates. Waiting too long to find a mate, on the other hand, means your character will begin losing strength and have less of a chance of passing down positive traits. As in Crusader Kings 2, you'll spend your autumn years doing what you can to ensure the success of your successor instead of simply building your current character into the ultimate badass, which creates another enjoyable layer of strategy. When you move onto a square with an enemy, you enter a combat screen. Combat itself is exceedingly simple: you and your enemy perform a single dice roll, which takes into account any bonuses you have from weapons or other items. Whoever has the highest dice roll wins, the loser gets a deduction from their lifespan, and the fight is over, even if no one has been killed. Fights with more powerful enemies, such as bosses, can require multiple encounters. While I understand the design choice behind such simplistic combat, maps can be absolutely crawling with foes and these fights grow stale rather quickly. The combat animation—in which one character whacks another, then the loser stalks away—doesn't add much and I grew impatient at having to sit through the same sequence time after time. Reaching a milestone, such as middle age, also pulls you off the map onto a new screen where you witness your character's appearance change—hair growing and turning gray—and while it's initially helpful to receive a warning that your clock is ticking down, these interruptions to watch such simple, repetitive animations grew tiresome as well. You're also limited to two item slots, which leads to a bit of juggling. One character of mine was equipped with a sword and shield, which meant that finding a treasure required me to drop my shield, travel to the treasure, take the treasure to town, then return to collect my shield. In a game where each step costs a year, completing this simple quest wound up taking a third of my life. This type of resource management, while adding another level of strategy to the game, ultimately feels more punishing than rewarding. Often the first dozen or so moves with a new character revolve around visiting known locations to gather money or repair buildings, and these activities take so much time off the clock I've wound up with characters who never moved more than a handful of squares from town for their entire lives. That can be a drag, but at the same time it can feel quite apt: after all, not every adventurer gets to have the adventure of a lifetime. I love the concept of Hero Generations, and the constant weighing of decisions and priorities that results from it. It's highly replayable due to the randomized worlds, and aside from the issues noted above it presents an enjoyable, bite-sized adventure that can be engrossing and challenging without taking precious hours from your own ever-ticking clock.